This is one of my favorite books of the year! Every year, 4th graders LOVE to read about Galapagos George and this picture book will make a great addition to this text set. I loved the structure of the book and the illustrations were amazing! Mrs. Richards will DEFINITELY need to get us this book! A posthumous work from the late, great Jean Craighead George telling the story of Lonesome George, the giant tortoise and last of his species who lived for 100 years. George also manages to introduce readers to evolution and leaves them with a poignant message about extinction and the need for conservation. Handsomely illustrated by the always reliable Wendell Minor. Such an eloquent story about how animals evolve and humans impact nature. Lonesome George reminded me of Ivan. A beautifully rendered and intriguing look at the evolution and behaviors of the Galapagos Tortoises. A marvelous tribute for Jean Craighead George, who passed away in 2012. 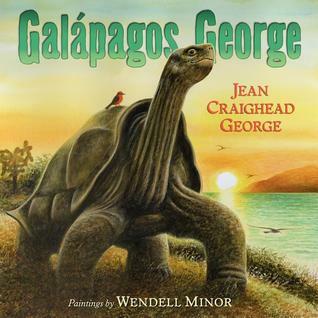 Galapagos George is a charming non-fiction narrative picture book written by Jean Craighead George and illustrated by Wendell Minor. Jean George accurately describes the evolution of the South American tortoise "Giantess George" through millions of years. Galapagos George is full of information making it so much more than your traditional read-aloud book. It would be a valuable addition to any classroom. The end papers feature a map of the Galapagos Islands with markings to denote Pinta, the island where Lonesome George was found, and the Charles Darwin Research Station on Santa Cruz island where Lonesome George lived from the early 1970's until 2012. Wendell Minor created the illustrations using Windsor and Newton Watercolors on archival 3-ply Strathmore Bristol paper. Recommended for ages 4-8,Galapagos Georgereceived the 2015 Cook Prize. George, J., & Minor, M. (2014). Galapagos George. New York, NY: HarperCollins Children’s Books. This is a book based on a true story about Lonesome George, the last giant tortoise of his species. It’s great for turtle & tortoise fans, science & history fans & animal fans.It is aimed towards elementary school students. There may be a few 4-5 year old preschoolers (tortoise fans?) who would enjoy it, but it is a longer book text-wise.The paintings by Wendell Minor are beautiful.The kids enjoyed discovering Lonesome George’s story and the book left them with many questions about extinction, helping animals and animal conservation. (Last year we went to see baby sea turtles hatching on the beach at a state park and the park employees explained the turtle conservation efforts, so this book tied in with a real-life experience of animal conservation attempts, concerning a different turtle).Kids voted to give the book 5 stars. Beautifully illustrated true story about the evolution of the giant tortoises and the sad demise of the saddleback tortoise species on the galapagos islands of which George was the very last of his kind. This book was the 1st I heard of the extinction and I am going to research it more. it would have been nice if a photograph of George was included in the book. Evolutionary history of Galapagos Tortoises.Beautiful, lush paintings as illustrations. Excessively sad book about the turtles of the Galapagos Islands. Lonesome George made me want to cry. Natural selection and human interference included. The story of the evolution of the 14 different kinds of tortoises on different islands that descended from 1 type in the deserts of South America.This is beautifully illustrated book. However, I expected better writing from George. The writing is often choppy and doesn't flow. I've never used goodreads for children's books, despite the fact that many are wonderful, remarkable works of art.I was reading this last night for the first time and by the end I was actually sobbing (ok, maybe I've been a little sensitive lately, whatever) because it was so moving and epic and perfect. C had to ask me "what happened momma?" and I tried to explain why the story was so wonderful. It doesn't matter. But I am determined at the very least to now use goodreads to track the perfect children's books I read. A story of evolution and extinction, this picture book explores the incredible life of the famous Lonesome George a tortoise who was the last of his kind. The book begins by explaining how a million years ago a tortoise was driven from South America and carried to the island of San Cristobal near the equator. There she laid eggs, used her long neck to reach food, and passed on her genetics. Thousands of years later, all of the turtles looked different with long necks and shells that curved back to give their necks more room. When humans discovered the Galapagos Islands, they quickly decimated the turtle population which dwindled down to only a few thousand from the hundreds of thousands that had lived there. A hundred years later, the giant tortoise population had reduced even further, so that one lone turtle remained. He was moved to the Charles Darwin Research Station and protected but no other turtle of the species was ever found.George creates a vivid story of the power of evolution in our world and the effects of humans on animal species. She steadily shows how weather forces and natural disasters impact animals as well, moving them from place to place and changing their habitats. As the animals change slowly, George keeps the text clear and factual, making for a book that moves quickly and is filled with fascinating scientific information.Minor’s illustrations are lush and lovely. They are filled with the light of sun, bursting on the horizon in tropical colors. He also shows the barren landscape of the Galapagos clearly and the frank regard of a tortoise looking right at the reader. There is a sense of loneliness for much of the book both when the book is about the first tortoise and then later when there is one left. That connection between the two lone turtles is made clearly in the illustrations.Fascinating, distressing and yet ultimately hopeful, this nonfiction picture book will work well in science classrooms as well as library collections. Appropriate for ages 6-9. Another of the many inspired pairings of naturalists Jean Craighead George and Wendell Minor.Despite its luminous content, in text and illustrations, there's a melancholy note to this title in the series. This is in part due to the fact that this is a posthumous release for Jean Craighead George, who, together with her long-time illustration partner, Wendell Minor, proposed this project more than fifteen years ago. At the time publishers hesitated due to its discussions of evolution. Sadly, JCGeorge died before its release, although she was able to see a draft version of the book before her death. This book chronicles the actual extinction of a species. Predictably, the reason for that loss isn't microbes or meteorites, but the destructive activities of humans. It begins with the story of prehistoric, desert-dwelling giant tortoise, Giantess George, whose fossil records indicate she lived long after the extinction of dinosaurs when furry creatures shared her desert, living in a land of earthquakes and volcanic eruptions. She survived a massive storm that washed her and other tortoises from the continental coast into the ocean. After millennia of adaptation and survival in nature, humans discovered and inhabited the island. The changes they brought with them destroyed habits, altered food chains, and eventually reduced the populations of each island species. Only in recent decades did scientists intervene to attempt to rescue the last of this Giant Tortoise species, dubbed Lonesome George. The sad truth was, though, that it was too late. When only one member of a species remains, population restoration is impossible. This is the story of one tortoise, and of many, of their evolution and their extinction. At the beginning, their was Giantess George. In the process of Earth's formation, she and her kin get swept off to sea, only to become stranded on a set of islands, where they need to adapt to their new habitats. Giantess George is fictional, yet her narrative, and those of her descendants that follow, are set within the real circumstances of history. Their evolution is followed by their destruction at the hands of man, and the author is very clear about this fact. Natural disasters led to their evolution, and mankind's presence did them harm. Finally, we come to the last, Lonesome George. While the summary suggests that this is his tale, he features only briefly at the end. Only general facts are included to keep the focus on evolution, and how Darwin discovered it in part thanks to the comparison he made between the different tortoises. A summary and additional resources are included in the back. Each image is painted realistically, and with a good amount of detail put into the changing environments. The triumph we feel from the survival of these species turns to sadness at the end. The author tries to mute this reaction with some inspirational words, and for children, it will bring them hope. However, for those that are older, and who realize how many species we are responsible for killing off, or are currently destroying, these words are hollow. This is another example of the growing trend of using biographical style to treat the story of a remarkable individual animal. Jean George shared her own surname with Lonesome George, the tortoise the story is about. So she used this name to trace the tortoise's ancestors back eons into evolutionary time. It was a good technique, and a simple way to present some scientific facts about the tortoises. At first I was bothered by the near duplication of Jason Chin's cover from Island: A Story of the Galápagos. But the interior was different enough that it did not feel like a simple ripoff. While the narrative held things together, it was not particularly compelling or engaging. The back matter has plenty of reference information both about the book itself and to guide me out to other sources. In particular, George mentions the Charles Darwin Research Station and near the end features working scientists--good move! This amazing book lacks only one thing: some photographs of Lonesome George. Otherwise, Wendell Minor's gorgeous paintings lend themselves well to this extraordinary true story of the tortoises of the Galapagos Island. George personifies the evolution story, introducing us to Giantess George, who might have lived a million years ago in South America. She imagines George's story, getting washed out to sea and landing eventually on a small island near the equator. She describes the evolutionary process and how tortoises on the Galapagos Islands developed long necks, so that they could eat leaves and tree branches, but how all of their shells developed differently according to which of the 14 islands they lived on. And a million years later, we meet George's descendant, Lonesome George, who hatched in 1912 and died in 2012 as the last of his kind. Tortoise lovers will be fascinated by this book, and will want to learn more about these amazing creatures at www.galapagos.org. Perfect for 3rd grade and up. 3.8 starsThe Galapagos Islands, far far off the coast of Equador, have many subspecies of the giant Galapagos tortoises. This nicely illustrated book explains the origin of one of the subspecies called saddleback tortoises. They probably arrived at the remote islands after a volcanic eruption or after a huge storm where they ended up floating on debris across the ocean to the remote islands. Over time, different characteristics evolved as the tortoises adapted to the different environments on the Galapagos Islands. One of the subspecies, the saddleback Galapagos tortoise, developed long necks and saddle-shaped carapaces. Due to human encroachment and to the release of predators such as rats, goats, and pigs, the last member of this subspecies died in 2012. This book tells the story of Lonesome George, the last of this subspecies of tortoises. This book traces the history of the giant tortoises of the Galapagos Islands "a story that took so long to happen that only the stars were present at the beginning and the end." The text is lyrical, the illustrations breathtakingly beautiful. The author traces the changes in the tortoises over the generations as conditions changed, and how Charles Darwin came to discover the tortoises...including the very last Galapagos Turtle...Lonesome George. A bit sad but also uplifting at the end. The notes include definitions of key terms, a timeline and a list of resources. The last page also includes the following note: "Jean Craighead George and Lonesome George passed away within weeks of each other in 2012. They were both one of a kind." How true. This is a gorgeous book about an ancient tortoise that came to the Galapagos islands. The writing is in story form which will make it more interesting for my students to read. We learn how tortoises lived and evolved on the island over millions of years. After the islands were discovered man naturally screwed the island up and many tortoises died. We are introduced to Lonesome George, the last of his species, who died a few years ago. This provides many facts in an easy to read format. At the end of the book there are more resources to research, a glossary, and timeline. I highly recommend this book, especially for the classroom. I liked the book because it helped introduce evolution to my children and we got to talk about it for awhile. I was surprised how much my kids enjoyed it even though they couldn't quite follow the timeline and distances.Pros: There is a lot to explore in Galapagos George: evolution, extinction of dinosaurs and other species, as well as global warming, ecology, and rising oceans. There is plenty to interest children.There's more to our review. Visit The Reading Tub®. While you’re there, add a link to your review of the book. Instructional as well as entertaining.Jean Craighead George with paintings by Wendell Minor educates the reader in the history and evolution of what are known as the Galapagos Tortoises.From the time after the dinosaurs roamed the earth to Lonesome George living out his final days at the Charles Darwin Research station on Santa Cruz Island, the reader learns about these magnificent mammals. At the end of the story, the reader will find two pages of key terms, resources and a timeline that could be used for further research into the George Tortoises or as a jumping off point for a classroom or home-school project. This beautiful picture book tells the story of Galapagos George, the last of the long necked tortoises of Pinta Island. The story starts 1,000,000 years ago in South America when a giant tortoise was swept out to sea by a huge storm. She was able to float and survive the trip to what are now known as the Galápagos Islands. It tells the story of the evolution of the long necked tortoise, and how that might have happened. It mentions people finding the Galápagos Islands and introducing species that threatened the tortoises. It is only in the last few pages of the book that Lonesome George is introduced. The book ends with his death. Love the opening line of this story! Readers are introduced to the giant tortoises that came to live in the Galapagos Islands and some of the most famous faces among them.The text, especially the tone, is top-notch here. The story is free from jargon and complex subjects such as evolution are described in ways that make sense to young minds.The watercolor illustrations are beautiful. They bestow upon their subjects an aura of majesty. Back matter includes key terms, a timeline, and resources (both books and websites). Highly recommended for grades 3-6+. I loved the story and the illustrations. There is real sense of sadness just under the surface in this book that is apt and heart-felt that is readily discerned by the reader. I think the text does a very good job of explaining evolution to a very young child. I do think it would have been good to have a bit more about Darwin in the story and his role since his theory is at the heart of the book. Still - a lovely excellent book that starts the process of understanding the concept of evolution as well as man's role in the loss of many species. A real telling of the Giantess Georges tortoises and their story of evolution over thousands of years.Beautiful illustrations take us back through time and show us what the world was like, how the tortoises witnessed earthquakes and volcanoes and how the crossed oceans. We learn of the Galapagos Island, Charles Darwin and the human impact on the environment and animals. A wonderful source to learn about this area of science through the gentle and meaningful story telling of Jean Craighead George. Wow! What a fabulous story of how the Galapagos islands became inhabited by tortoises and the sad story of their extinction. The illustrations are great, telling the story even if there were no words. I think this book would do well in an elementary school as well as in middle. The story of the tortoises life on the islands and the adaptations they developed should carry into middle school science. I love it! This beautifully illustrated book by Jean Craighead George takes a look at evolution and adaptation to explain how tortoises ended up on the Galapagos Islands and evolved so differently. It's so sad that the last descendant of Giantess George, Lonesome George, died in 2012 and was the last of his kind. It's also sad that Jean Craighead George passed away within weeks of him. She was the last of her kind, too. We will miss her gift of writing. Jean Craighead George - Jean Craighead George wrote over eighty popular books for young adults, including the Newbery Medal-winning Julie of the Wolves and the Newbery Honor book My Side of the Mountain. Most of her books deal with topics related to the environment and the natural world. While she mostly wrote children's fiction, she also wrote at least two guides to cooking with wild foods, and an autobiography, Journey Inward.The mother of three children, (Twig C. George, Craig, and T. Luke George) Jean George was a grandmother who joyfully read to her grandchildren since the time they were born. Over the years Jean George kept one hundred and seventy-three pets, not including dogs and cats, in her home in Chappaqua, New York. "Most of these wild animals depart in autumn when the sun changes their behaviour and they feel the urge to migrate or go off alone. While they are with us, however, they become characters in my books, articles, and stories."